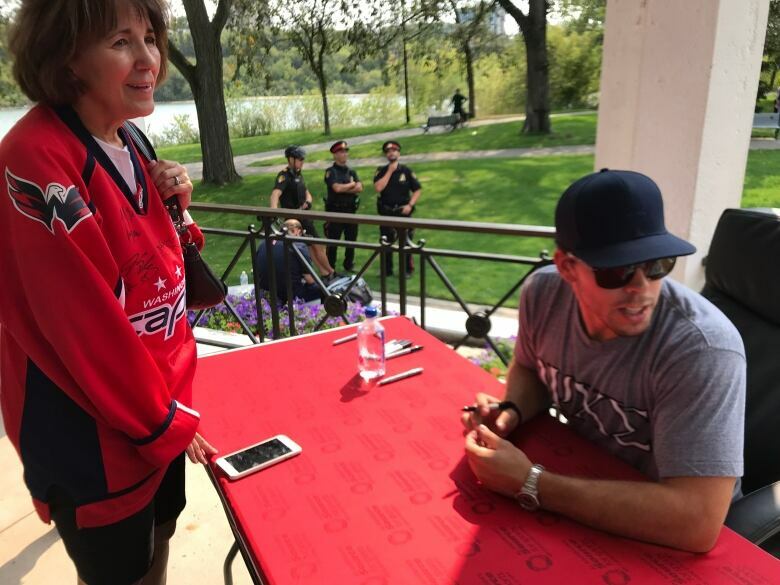 Saskatoon-born Washington Capitals player Chandler Stephenson brought the Stanley Cup to Humboldt, Sask., today, four months after a fatal bus crash involving the Broncos' bus devastated the community. The Stanley Cup has arrived in Humboldt, Sask., thanks to Saskatoon-born Washington Capitals player Chandler Stephenson. 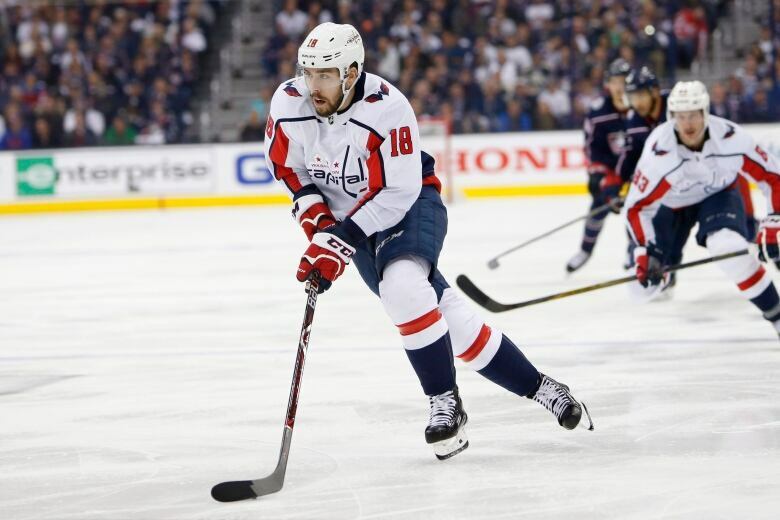 The Capitals won the NHL championship in June, prompting the forward to promise a trip to Humboldt with the trophy in tow. On Friday, Stephenson said the decision to bring the Cup to the small community was a "no brainer." 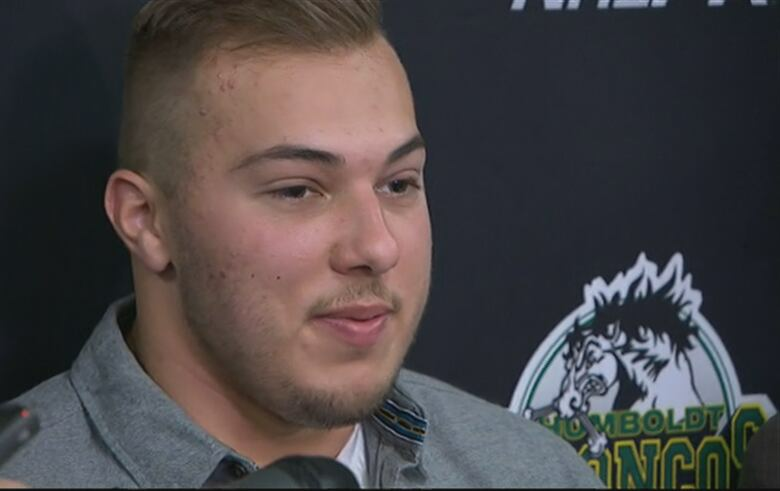 He said the success of the GoFundMe fundraiser for the Humboldt Broncos shows how deeply the fatal bus crash rocked the entire hockey community and others around the world. "It's like losing a family member when something like that happens — like a brother," Stephenson said. "It's a terrible thing. You can't replace a life." Stephenson once skated alongside two Broncos players: Kaleb Dahlgren and Brayden Camrud, who both survived the April 6 crash, when the Junior A team's bus and a semi-trailer collided, killing 16 people and seriously injuring 13. Dahlgren, who will play hockey with the York University Lions in Toronto this season, said Stephenson texted him after his Stanley Cup win, saying: "You're coming to Humboldt with me." A few other teammates also made the trip to comfort the families of the players who lost their lives, Dahlgren said. They all met in a room at the event centre on Friday morning. "I was holding back tears, for sure," said Dahlgren. "It's hard to see the families." Although Dahlgren will be playing for another team, he wished the new Broncos luck and acknowledged the responsibility they have. "I just want them to have a great season in honour of everybody and for that crest on their chest," he said. Jamie Brockman, the Broncos' new president, told reporters that Friday was a big step for the team, with both the Stanley Cup in town and the club's training camp kicking off. "The community is looking to move forward here," he said. "This is another step today." Brockman said all the new players are looking forward to getting on the ice today. The next hurdle, he said, will be the team's home opener on Sept. 12. 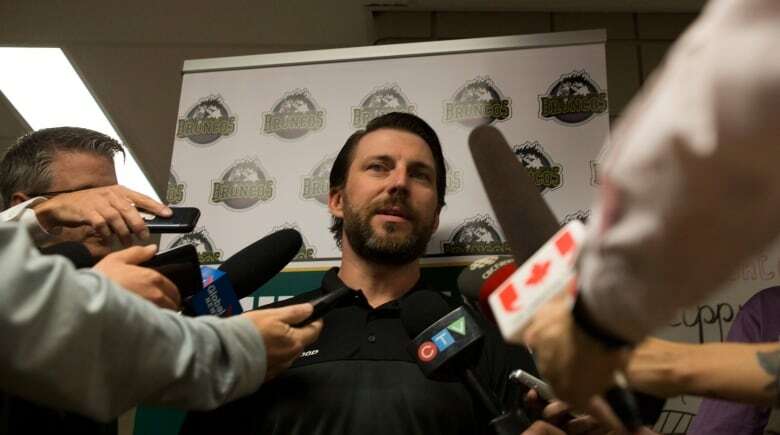 Nathan Oystrick, a former NHL defenceman and the new head coach of the Humboldt Broncos, also said he's excited for the start of the hockey season. He takes on the role after former head coach Darcy Haugan lost his life in the crash. When asked what he would do to carry on Haugan's legacy, Oystrick said he was just going to be himself. "Darcy, by all accounts, was a great human being," he said. "I'm going to do my job, just try to work hard, and try to make everyone proud." Between 75 and 80 players will hit the ice this evening for the Broncos' training camp, Oystrick said, which will start off with four practices and continue with scrimmages all weekend. The start of camp will allow the team to move forward a little bit, he said. "No one's ever going to forget about what happened. But this is a chance for the new group to make their own journey," Oystrick said. "We're just looking forward to a good season." The Regina-born coach said he hired three support workers to help with the team's physical, mental and emotional health. The Saskatchewan Junior Hockey League also offered ongoing support to players, families and billets, he said. 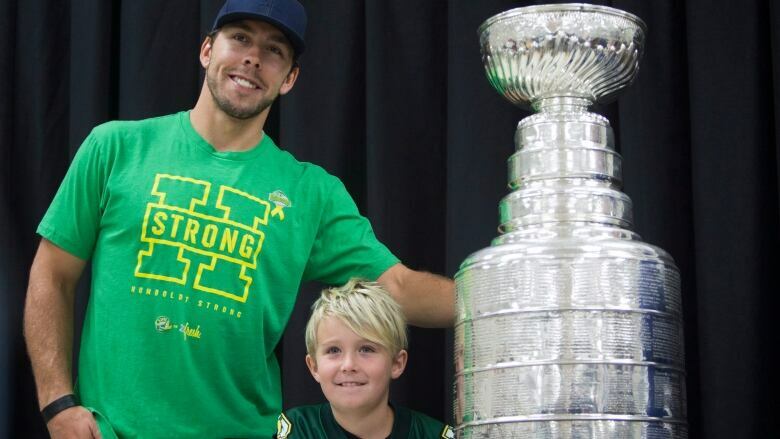 Chris Campoli, from the NHLPA, accompanied the Stanley Cup to Humboldt on Friday. He said all of the NHL players he talked to all wanted to make sure people in the community knew they weren't alone. "Families are going through a process of grieving, and you just want to let them know that we're here," Campoli said. "They're supported and we're thinking of them." "Going forward, we want to be there. Those boys won't be forgotten." Campoli called the families of the deceased and injured players, as well as the whole community of Humboldt, a "resilient group." Before the Cup arrived Friday, Humboldt Mayor Rob Muensch said he hoped the visit would bring some cheer to a community that has been through a lot, noting he expected "big crowds" and "lots of excitement." "When Chandler mentioned after he won the Cup that he was bringing it to Humboldt, I think everyone here was so appreciative of that. This will truly be a nice day for everybody." The trophy was on public display from noon to 1:30 p.m. CT. People from all over Saskatchewan, as well as neighbouring Alberta, came to Humboldt to take in the event. 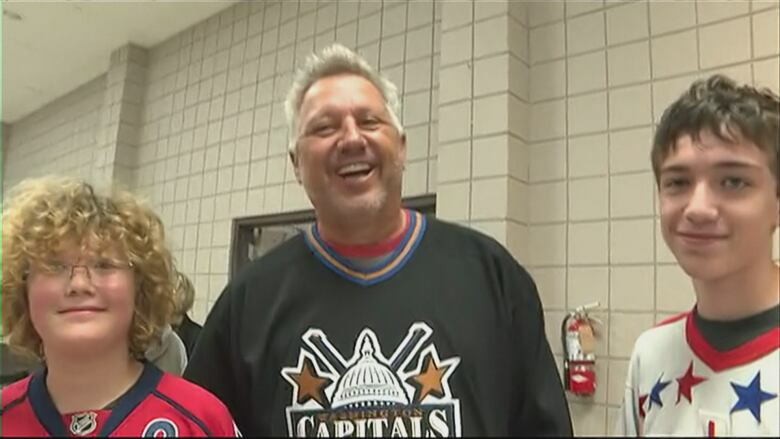 Dressed in matching Capitals jerseys, the Thera family made the 860-kilometre trek from Slave Lake, Alta. Wayne Thera said his children weren't diehard Capitals' fans, like him, but they do support the Humboldt Broncos. "Everybody's Broncos' fans now, I think," he said. In addition to seeing the Cup, visitors on Friday could take part in scrimmages and floor hockey, as the Broncos prepared to take the ice as a team for the first time since the crash. Ultimately, the mayor said he hoped Friday's events would help the community move on. "We are looking forward to seeing the players back on the ice and seeing who will make up the team for the season coming forward," he said. "We are taking all these events that are coming into our community and try to spread the happiness."